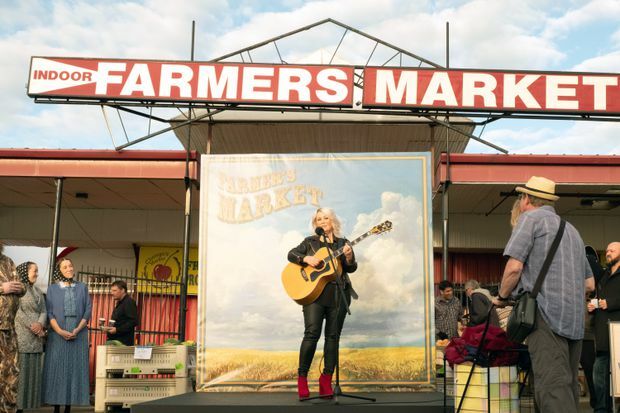 Musician and former star Jann Arden is having a rough week in both her career and personal life in the TV show Jann (2019). It was brave of CTV to build a show around Jann Arden. But, not all that brave. Arden is beloved, funny and wise and didn’t start doing what she does today or yesterday. It was only brave in the context of mainstream Canadian TV to put a Canadian singer at the centre of a comedy show. For all of Arden’s charm, the series is so wildly inconsistent that it frustrates rather than fulfills. It is often so frantically paced that sometimes you get tired watching it. In the show – and I recommend you see it – Arden’s career is on a severe slide. (In the first episode, she plays at a Farmer’s Market and is paid in cheese.) She is, mind you, irreverent, sharp-tongued and essentially has no filter in the matter of her “lady bits”, personal hygiene and other intimate subjects. She’s sticking with her terribly inept manager Todd (Jason Blicker). Her younger sister Max (Zoie Palmer) takes care of their mother, but when Max gets unexpectedly pregnant, Jann takes care of mom. Into her life comes cutthroat millennial music-biz wizard Cale (Elena Juatco), who for charitable reasons that are out of character, decides to revise Arden’s career upward. Oh and Jann’s love-life is a disaster after being dumped by her girlfriend Cynthia (Sharon Taylor). In the first episode, Jann plays at a farmer’s market and is paid in cheese. What’s going on in this curious mixture of satire, self-deprecation and standard sitcom comedy, has an allure because, first, it’s an inside-joke about the music industry in Canada while being fictional. But it careens from one crazy mess in the fictional Arden’s life to another. Then it occasionally stops for some heartfelt material. This is particularly true of the fictional Arden’s dynamic with her mother. Mom Nora (Stratford veteran Deborah Grover) is in declining mental health. Since most people know Arden’s mother died last year and Arden wrote a book about caring for her mom who had Alzheimer’s, that portion of the storyline feels poignant. It’s an odd fit with the craziness going on around it. There’s an existing history of TV series that are anchored in fictional versions of the star’s real life. Seinfeld was exactly that at the beginning. But a closer relation to Jann is The Chris Isaak Show, which ran on Showtime from 2001 to 2004. Indie rock star Isaak played himself and the show simply amplified his real life into a surreal set of misadventures. It was the surreal quality that made it tick, allowing the humour to emerge slowly and organically and allowing Isaak’s image to be mocked while staying linked to his real music and his real band. In contrast, Jann (the creators are listed as Arden, Leah Gauthier, Jennica Harper) feels like a network sitcom torn to pieces and then put back together to make a fictional Arden fit into it. Some sequences work beautifully. One, which has the fictional Arden trying to get more prominence in a charity recording, is very funny because it has the texture of the music racket being derided with an insider’s knowledge. Arden has the kind of magnetism and wit that makes her a natural fit for TV. That’s why it doesn’t seem necessary to force the jokes and overdo the physical comedy about her body, and turn so much of the show into a burlesque exaggeration of the real Arden. It’s not that Jann is a failure. Far from it. Arden singing and being funny is a happy sight to find on TV. And this series could be fixed if it continues. More drollery, less fake drama. More emphasis on how truly surreal the music business can be. Not just silly, but distinctly mind-boggling. If there is to be poignancy, it would be better if it sprung naturally from the good-natured comedienne that the real Arden is, and the fictional one that Arden – and the writers – seem overanxious to hide.